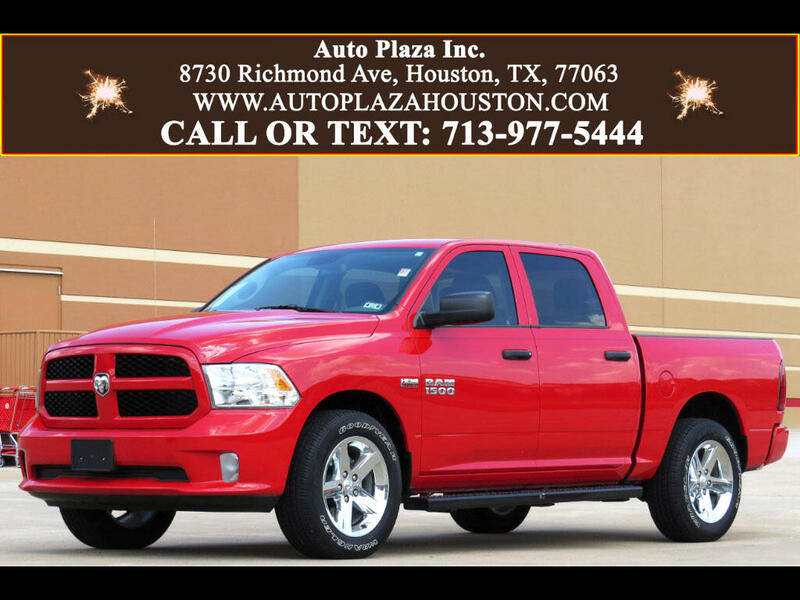 Used 2014 RAM 1500 Express 4x2 Crew Cab 5'7" Box for Sale in HOUSTON TX 77063 Auto Plaza, Inc.
With Remaining Factory Powertrain Warranty Good thru 05.13.2019 or 100k Miles!!!! BIG, BOLD and BEAUTIFUL!!! Presenting This ONE OWNER 2014 Dodge Ram 1500 with an Automatic Transmission. Options Include, 20' Aluminum Wheels, Fog Lamps, 5.7L V8 HEMI, 3.55 Rear Axle Ratio, Touchscreen Display, Uconnect Voice Command with Bluetooth, Mobile Phone Connectivity, Media Hub – USB and AUX Input, Sirius XM Radio, MP3 Player, Cloth Interior, Class IV Receiver Hitch, 7 Pin Wiring Harness, Trailer Tow w/4-Pin Connector Wiring, HD Transmission Oil Cooler, HD Engine Cooling, Power Heated Mirrors, Electronic Stability Control, Tinted Glass Windows, Remote Keyless Entry, Air Conditioning, Automatic Headlamps, Audio and Cruise Controls on Steering Wheel, Power Locks, Power Windows, Power Steering, and More! This Dodge Ram really is the Perfect Combination of Sheer Brawn and Beauty! So What Are you Waiting for? Call NOW to Schedule a TEST DRIVE! Financing Available!